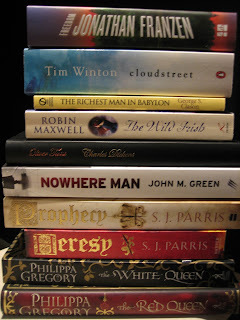 Well, 2012 has arrived, and I've been thinking about my year of reading in 2011. I fell just short of my goal to read 60 books, bugger! My original goal when I set out in January was 55 though, so when I achieved that I increased it to 60, so I guess from that perspective I should be happy. My final tally was 57 books and a total of 19,035 pages read; a personal best! I was lucky enough to receive some books under the Christmas tree this year, and picked up 3 more on the weekend at a book sale where all books were $4.95; a bibliophile's dream wouldn't you agree? 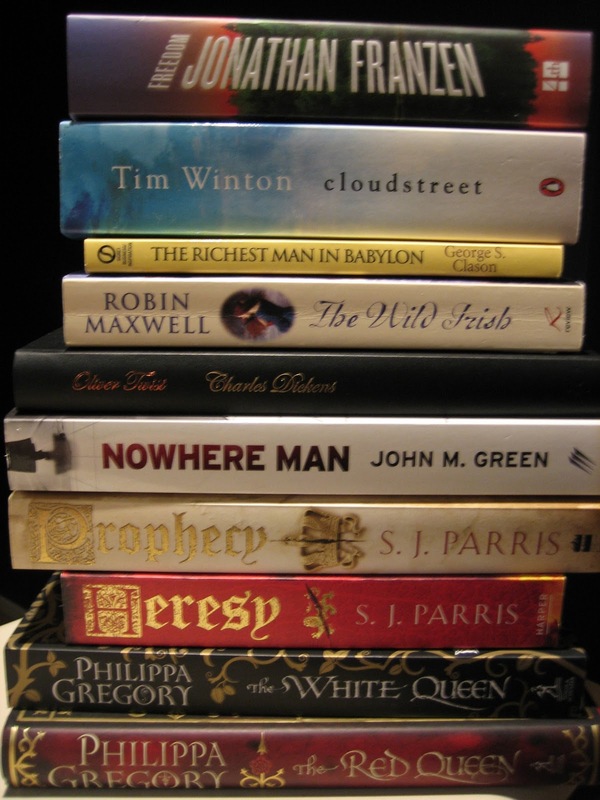 So I thought I'd share a photo of my TBR (To Be Read) pile with you, as it appears at the beginning of the year. Two in the photo are competition winners from 2011, and I have 3 additional ebooks from authors to add to the pile. Lots of reading pleasure to look forward to in 2012. Have you set yourself any reading goals for the year ahead? I am going to try to read 60 books again this year, so wish me luck. What reading pleasures or new releases are you looking forward to this year? My goal is to read one "for fun/for me" book per uni term, and at least 4 every uni break! I'm most looking forward to John Scalzi's newest book (coming out June, boo!) but have a couple due in the next week which I've wanted for a while (yay!). Too bad I have a major uni essay due next month (which I haven't even begun research for).... Is there a book (or two) you are most looking forward to, Trace? They sound like achievable plans :-) I'm most looking forward to the new one coming out by Anne Rice, The Wolf Gift. I received a Dymocks voucher from family for Christmas (woohoo) and I'm saving it for that, I'm itching to read it! Nice little starter pile there for you. Just revisiting this post and my TBR post has more than trebled thanks to a generous friend, several books from a publisher and winning nine books in a competition yesterday. GoodReads tells me I am 4 books behind where I should be if I want to stay on target to read 60 books this year, so better get a wriggle on. How is everyone else going on their reading plans? Not long until your John Scalzi book is out Selwyn?